Imagine for a moment, that you are an early French explorer, stumbling upon these crumbling ruins in the shadowy half light of dense tropical jungle. And making the startling discovery that those tree covered towers are in fact eerie, mysterious faces! Hundreds of them! With hooded staring eyes and implacable smiles! In the vast silence of that not too distant past, would you have been overawed? Terrified? Would you have offered obeisance? Or fled in fear? Today, shorn of the stranglehold of the jungle, the temple of Prasat Bayon looks like a ragged, incoherent heap of towers. Until that is, you spot those faces. Those 150 odd enigmatic, smiling visages gazing in every cardinal direction. As much a proclamation of a God King’s omnipotence, as the compassionate benediction of the Bodhisattva. Undiscovered until long after Angkor Wat, and mistaken for a Hindu temple because of its quadruple faced towers, this extraordinary state temple of Jayavarman VII, the first Buddhist king (of the Khmer), is a celebration of religion, art, science and power. and the complete antithesis of the classical Angkor style of architecture of the previous century. 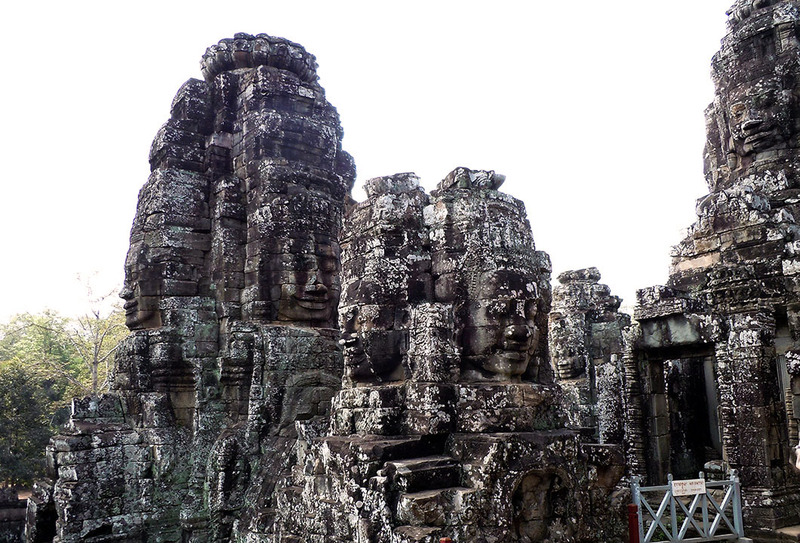 Bayon sits at the geometric centre of Angkor Thom – Jayavarman’s magnificent new walled city, just eight miles North of Angkor Wat – and is equidistant from its four majestic gates, topped with more giant faces! It is believed that the temple was designed as a replica of the Khmer empire. 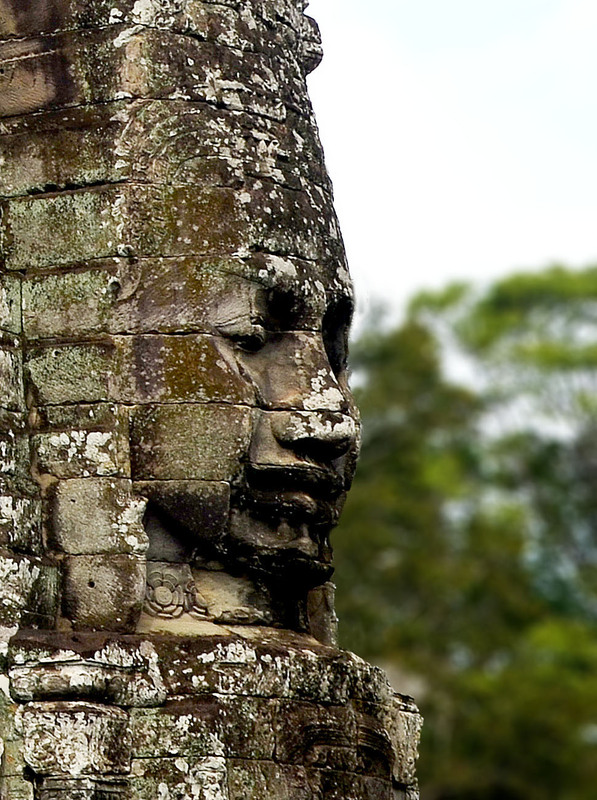 As a symbol of Jayavarman’s control over his vast empire, with its 54 towers representing the 54 provinces of the kingdom. Their varying heights depicting the size and importance of each province. Only 37 remain today. It wasn’t until 1933, that the discovery of a vandalised Buddha and Sanskrit inscriptions from beneath the central shrine, proved beyond doubt that this was a Buddhist temple dedicated to the Buddha in the form of Avalokiteshwara (the compassionate one), believed to be portrayed in the likeness of the king. Most possibly symbolising the benevolent king as deity (a legacy of his Hindu upbringing), rather than a display of monumental ego. 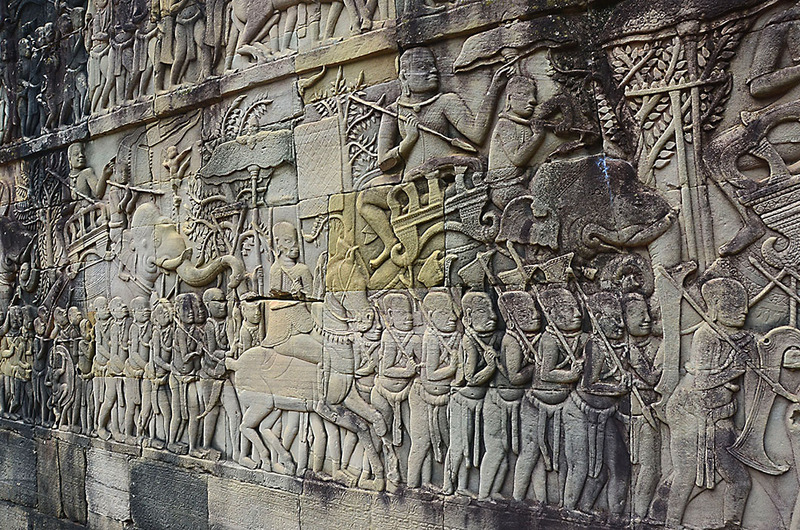 The outer walls of the Bayon, host a series of bas reliefs that depict marvelous vignettes from daily Khmer life, interspersed with war scenes including the defeat of the invading (Vietnamese) Chams. While the inner galleries are dedicated to life in the palace and religious ceremonies. Representing the pinnacle of Jayavarman’s ambitious expansion and construction drive that included vast road networks, resthouses, orphanages and hospitals, the Bayon, was the last of the grand state temples of the Khmer. And the last constructed with stone. It is, more often than not, the great king that leads a great empire to its zenith that sets in motion the beginning of its end. Jayavarman VII was one such. The builder king – considered the greatest builder of all time – exhausted the resources of his state. The empire that under him stretched from Southern Vietnam to Laos, and from the Mekong river to Burma, with a capital that was far bigger and far in advance of any European city of the time, began its inexorable slide into decline. But his timeworn likeness has incredibly resisted the ravages of centuries and continues to smile at man’s delusions of historical immortality. As to your question, I would be in awe and would want to learn more. Fantastic pictures of this great place! Pingback: CBBH Photo Challenge: MULTI-COLOURED | East of Málaga .... and more! Impressive photos … your questions are difficult to answer. I’m not sure what I would have done. I am glad I can enjoy them without the pressure of the experience. 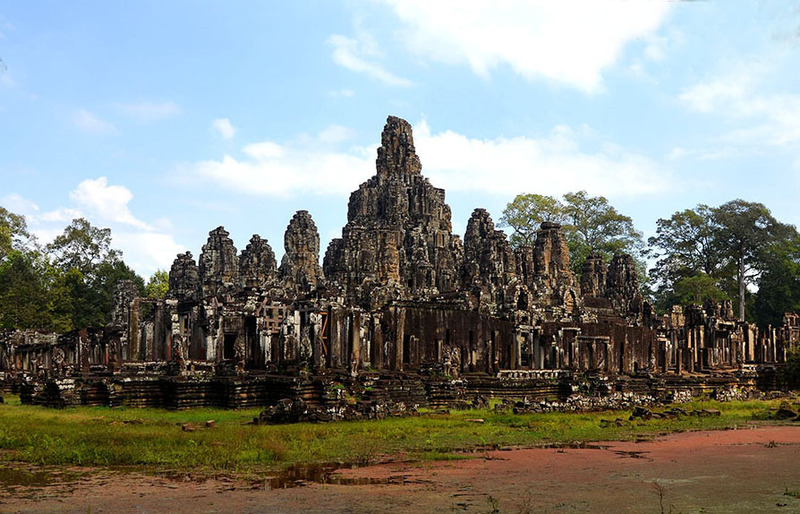 Bayon is a richly decorated Khmer temple built in the late twelfth century or early thirteenth century. I want to see and photograph these ruins so badly. Incredible, Madhu. What I wouldn’t give to see it myself. I mean that seriously. I feel like salaving for a year in exchange of just being there. 😀 It’s definitely not just a monumental ego now, but a real piece of great history. I also love the last part. It’s good to know that it’s most possibly there to stay if I did chance to be there.